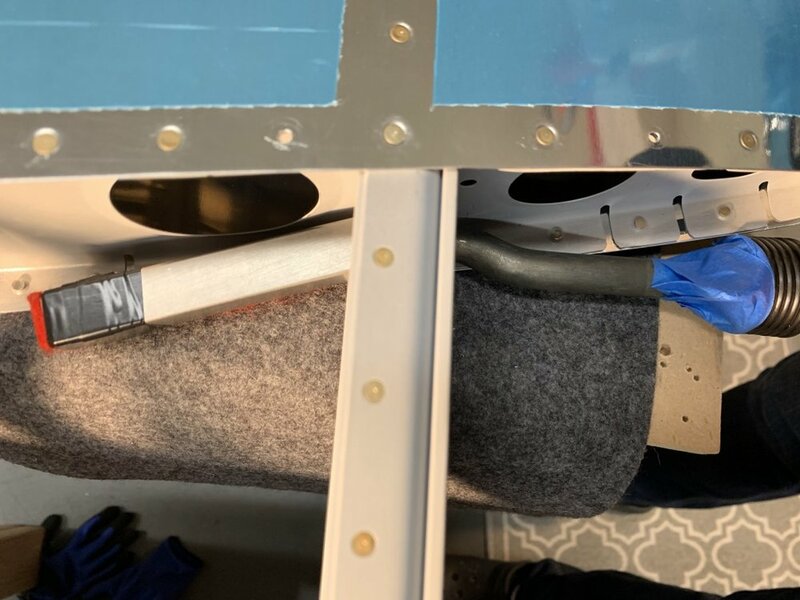 I haven’t made many updates because all the activity has been focused on setting the hundreds of rivets which connect the the ribs, spars and skins. I bucked all the rivets which couldn’t be accessed with the squeezer using the flush set and the tungsten bucking bar. The process involves reaching inside the assembly from the aft (as it’s held in the cradles upright) with one hand to hold the bucking bar and riveting with the other hand. The instructions call for you to work your way up and toward the back of the assembly. In the areas near the center where the stringers attach, the shop-end of the rivet being set aren’t visible, so I used my fingers to locate and hold the bucking bar in place. Riveting the skins to the rear stringer assembly. I worked one side at a time. The rivets which attach the skins to the ribs below the stringers were hidden from view. I had to buck these rivets blind then place my phone camera inside and take a picture to verify that the rivets were properly set. 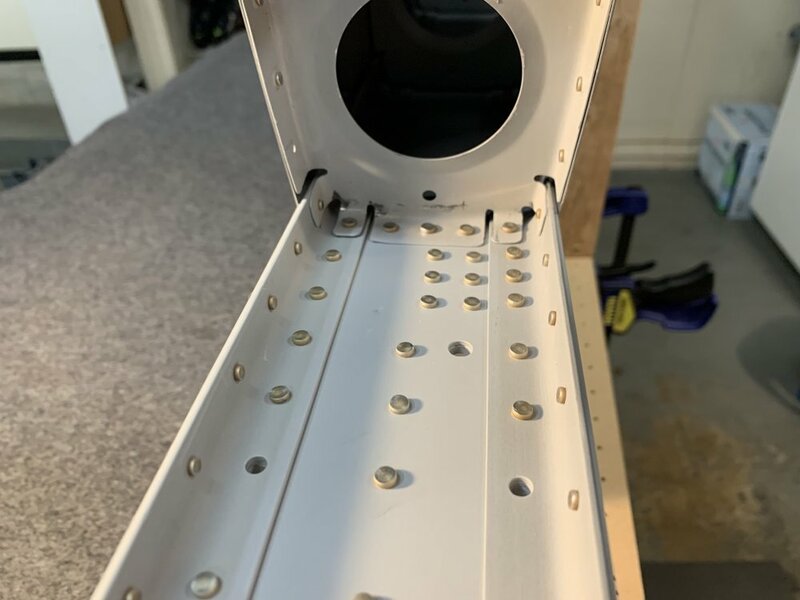 After riveting all the ribs, I installed the rear-spar assembly and clecoed in place and set the LP4-3 pop-rivets , then used the squeezer to set the rivets that attach the spar to the skins. After riveting the rear spar, I pulled the stabilizer out of the cradles and finished the nose ribs. I was able to use the squeezer for all of these rivets since they were easily accessible. The last rivets to do were the universal head rivets to the 4-7 and 4-8 rivets which connect the nose rib, front, spar and inspar rib together. I used the offset rivet set and tungsten bucking bar to carefully set these rivets. I was very careful to keep the rivet set centered on the rivet head and slowly set the shop-head. It took about 80psi to get the rivets to set properly. Overall, I was pleased with the results. Some marring of the metal surface where the bucking bar taps the adjacent rib and flange. I added a little touch-up primer on these areas.